A man who felled a rugby fan with a single punch in a Leamington bar has escaped being jailed – despite fracturing his victim’s cheekbone. Adam Rowse pleaded guilty to inflicting grievous bodily harm on Richard Marsh during an incident in the Moo Bar in Leamington town centre. 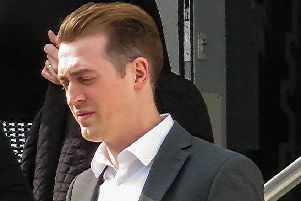 Rowse, 21, of Tudor Court, Church Lane, Nuneaton, was sentenced to 12 months in prison suspended for 18 months, and was ordered to take part in an offending behaviour programme and to pay £250 costs. Prosecutor John Brotherton said that in September 2016 Mr Marsh met friends in Leamington to watch a Rugby World Cup match, and they ended up in the Moo Bar in Russell Street. At 1.45 in the morning he was standing by the door, and the next thing he recalled was lying on the floor being tended to by other people. Witnesses said they had seen him and a man in a white shirt squaring up to each-other before he was headbutted and knocked to the floor. Mr Marsh was helped to his feet, but was then punched to the face by Rowse, knocking him back down. An ambulance was called and he was taken to hospital where it was found he had suffered a fractured cheekbone, which has left him with ‘a slight deformity to his face,’ but he failed to attend a follow-up appointment. Mr Brotherton explained part of the delay in the case was because a second man had been due to stand trial over his alleged involvement, but a decision was taken in March to offer no evidence against him. Andrew Tucker, for Rowse, said: “He himself was the victim of a very similar attack when he was punched to the back of his head and suffered a fractured skull which kept him off work for some five months. Sentencing Rowse, Recorder Mainds told him: “There is clearly generally good in you, and you are well-respected by those you work with.